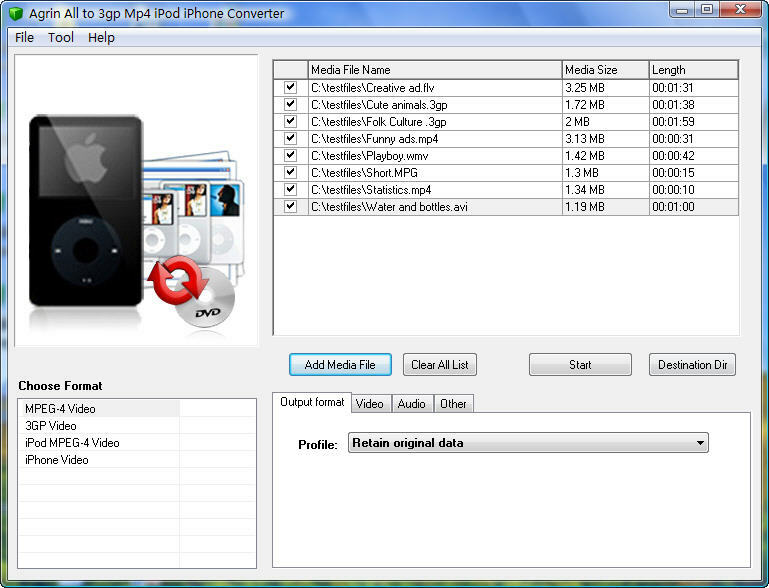 Agrin All to 3gp Mp4 iPod iPhone Converter can let you convert between popular video formats so that you can instantly receive what you need.You will be amazed at the fast speed and good quality.Another, it can convert video files including AVI, WMV, MPEG, MPEG4, ASF, VOB, 3GP, iPhone, MOV, FLV to MPEG4,3GP,iPod,iPhone with ease. You can control parameters including video size, video quality, frame rate, aspect etc. Choose it to change your single life. You can play on iPod , iPhone . Qweas is providing links to Agrin All to 3gp Mp4 iPod Converter 4.2 as a courtesy, and makes no representations regarding Agrin All to 3gp Mp4 iPod Converter or any other applications or any information related thereto. Any questions, complaints or claims regarding this application Agrin All to 3gp Mp4 iPod Converter 4.2 must be directed to the appropriate software vendor. You may click the publisher link of Agrin All to 3gp Mp4 iPod Converter on the top of this page to get more details about the vendor.